If you ask the parent of almost any toddler or preschool what would make life easier, it is if their child could just learn to control their emotions. Controlling emotions is really hard. Children’s brains are programmed to have strong emotions, and the areas of the brain that process and control emotions are not yet developed. As a results, toddlers’ and preschoolers’ behavior is often controlled by emotions. 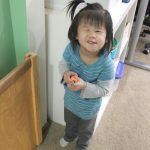 This results in many highs (“I love this kind of noodle!”) and lows (“I can’t wear the pink socks, they have strings!”) of each day that often baffles parents (“She was just happy a moment ago?”). Frequent tantrums are normal and part of the developmental process of learning to control and regulate emotions. 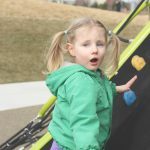 I encourage parents to view this very frustrating phase with a bit more patience and to realize that the struggles are really learning opportunities. As an occupational therapist, I have worked with many children who struggle with emotional regulation. This skill is immature in most developmental disabilities, and is also a core deficit in autism spectrum disorders. Emotional regulation also appears to an area of concern for children with attention and behavior disorders (such as ADHD, ADD, anxiety disorders, and conduct or opposition deficient disorders). The complex skill of emotional regulation doesn’t emerge overnight, but slowly over time. The first step is to learn what emotions are and how they feels. There are many ways parents can help strengthen this for children. Be a good role model. By “good,” I don’t mean show only positive emotions. I mean show all the age-appropriate emotions for your child and show how you stay in control of your emotions. Child need to know that everyone has emotions of all kinds. During the toddler and preschool years, children are still very connected to their parents, so letting children share a parent’s experience of emotions is a powerful learning tool. Label and describe. Emotions come from the center, primitive part of the brain. By connecting the emotions with language by naming and talking about the emotions, it using the processing and thinking parts of the brain. The processing areas of the brain will eventually lead a child to regulating their emotions. Work towards having your child label how they are feeling, which helps them start to control the emotion. Experience emotions by acting them out. When children have real emotions, it is often really hard (if not impossible) for them to process and learn new information. Sometimes the best way to learn about emotions is to act them out (play pretend). 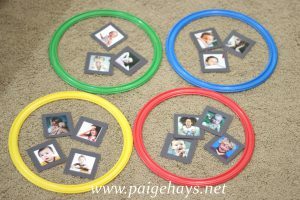 A great activity is for parents and children to take turns acting out emotions and guessing what others are feeling. 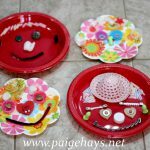 Pretend play is another great way to experience emotions by acting them out. Use all the media in your homes as examples (books, TV, movies, toys). Children can see and understand emotions in others before they can in themselves. It is safer and easier for most children to talk about other people’s feelings (especially negative feelings). Some books or shows are about emotions, but anything with visuals can be used this way. Look at faces and bodies in books and talk about what they might be feeling and why. It is OK to disagree and discuss- this helps children build mental concepts about emotions that are flexible (rather than black and white thinking about emotions). 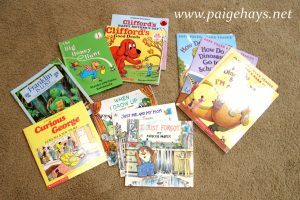 There are some great book series (free at the library) that have good representations of social situations and emotions- Franklin, Berenstain Bears, Curious George, How Do Dinosaurs, Little Critters, and Clifford. Begin a family routine that includes reflection. Whether at family meal time or at bedtime, having a time where all family members share about their day, including reflection on emotions, is a great way for children to learn. This gives parents and opportunity to role model when talking about their day, and gives children a chance to think about emotions. Don’t expect accurate or complex answers from children- it is more about the effort than about the actual answers. Example routines might be telling a “high” and “low” from the day or something that they enjoyed and something that was a struggle. Take photos of a child acting and make a simple book. 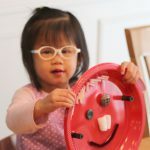 Self-awareness of emotions can be a hard step for children because they can’t see and hear themselves having emotions. 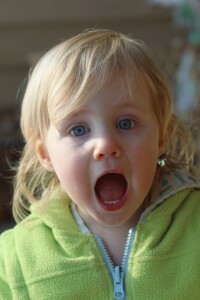 Additionally, when children have big emotions, it is hard for the brain to process and learn. By creating a visual book, it helps children to reflect on their own emotions in a safe way when they are able to learn. Add words to the book to describe the emotions- big, strong, little, safe, weird. Describe how the body is looking and feeling- heart is going fast, eyes are wide open, finger are curled up, eyebrows are scrunched up. Encourage children to think about emotions. Show them how (role modeling) and praise them when they consider emotions. Ask “how do you feel?” and encourage them to ask you and others how they feel. While reading books, watching TV, or playing with sibling, make the questions so frequent that children will start to think of them and ask them on their own. A parent’s words will become how you child thinks- if you say it enough, you child will start to think and say it too. Use art, music, and dance as a way to relate to emotions. Talk about how the art form (picture, song, or dance) is like emotions. Create your own picture, music, or dance. Children often get stuck thinking that emotions are bad and need to be ignored. It is good to feel emotions and to know how to express them. 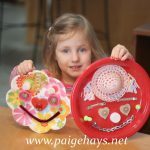 Art is a great way to teach children an appropriate way to express emotions. 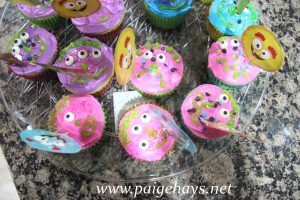 Just remember that emotions are everywhere around you (even in monster cupcakes!). Just start looking and you will find lots of opportunities to role model, teach, and learn in your daily lives. Ready for the next step? Consider using a program like the Zones of Regulation by Leah Kuypers or working more on executive functioning skills.